Fig. 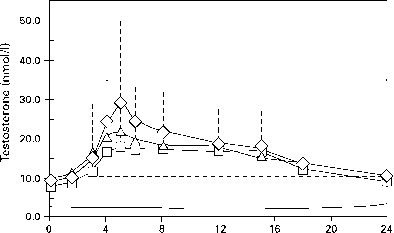 14.3 Mean (±SD), baseline-adjusted serum concentrations of testosterone after application of placebo (solid line), 10 mg (squares), 20 mg (triangles) and 30 mg (diamonds) of buccal testosterone at steady state (day 10 of dosing). 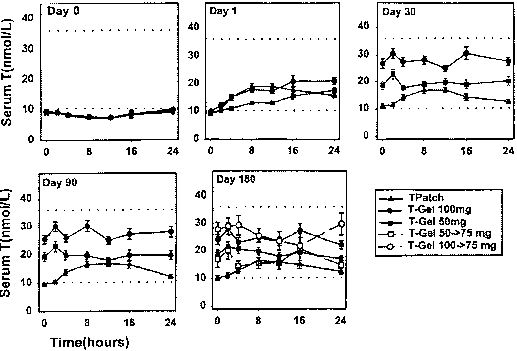 Broken lines indicate normal range of testosterone (adapted from Baisley et al. 2002, reproduced by permission of the Society of Endocrinology). be achieved this therapy would require repeated daily applications and would have the same disadvantages as conventional oral testosterone undecanoate therapy.